Yeah, but: Not bad, but it's nothing to write home with. The Long Version: I bought this because I wanted a nice pen, and I know that Caran d'Ache makes good ones. I know this because Rado, the Swiss company that makes scratch-proof ceramic watches - so they'll never look worse than they do on the day you buy one - had some as promotional items and I snagged a couple of them. Caran d'Ache is also Swiss, so it keeps it all in the family. A lot of people use my pen in the course of a week, and the most frequent comments I get are about how small my pen is, and how slippery my pen is in their hand. I'll admit that my model 849 is smaller than average, but it fits my hand and it's easy to carry in my pocket, so it suits me just fine. The slipperiness is a problem that I have to agree with: it can be hard to use when I need to write on carbonless paper, and I often find that I need to grip the shaft so firmly that my hand starts to cramp. If I'm writing with a more relaxed grip the pen is comfortable, but the legibility of my writing isn't something that's improved by being fast and loose. From the photos on the maker's web site, I think I have the glossy-finished "Metal X" pen. The Rado promo pens - I eventually found them packed in a box from my last move - have a much more comfortable matte finish which gets rid of the grip problem, and it doesn't detract from the look or carrying convenience of the pens. If you have a choice, pick the more textured finish. If you don't have a choice, you might want to skip the smooth version. They look very nice, but ultimately I prefer my buy-it-by-the-dozen Papermate Comfortmate Medium to write with. updated February 2013: four years later, I have an update. I spotted this pen few years ago from a colleague, and inmediately caught my attention. That one was a gift from the Swiss postal service, and had a nice logo. It was only a couple of weeks ago that I could buy it in a shop. I had already forgotten about the pen when I saw it in a shop's showcase. I am really excited with it now. 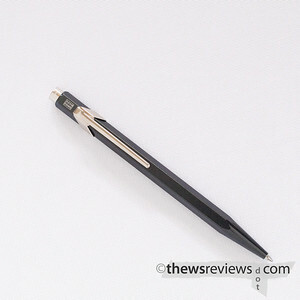 It is an excellent pen, beautyfully designed and superbly manufactured. Every detail is excellent, and you could not get more for this value (14 €). In these times where everything comes from China it is still possible to enjoy an excellent product. For me it is even better than a 250v€ Montblanc pen, because if you lose that's not such a big deal. Marc, I'm still amazed that there's no word in the English language that expresses the feeling of using something that's exceptionally well-made. We really need one. If you write correctly, this is undoubtably the best ball point money can buy. Beautifully made, designed, balanced and weighted with a wonderfully unique and smooth 'non click' operation. Buy the ordinary 849 not the 'metal x' [which has a different coating] and the pen won't slip in your hand. And no, Parker refills do not fit this pen properly. Using one will result in irritating nib wobble. I have used the same one since 1972 and can vouch for its reliability.